Peltiers, Thermoelectric Modules (TEM's, TEC's)Thermoelectric modules or peltiers are often abbreviated to TEM’s (Thermo Electric Modules) or TEC’s (Thermo Electric Coolers). We supply the full range of Laird TEM series; CP, PC, ThermaTEC, PolarTEC, UltraTEC, High Power Density, OptoTEC, Multistage & Centre Hole. CP Series - Ceramic Plate Thermoelectric ModulesThe Ceramic Plate (CP) Series of Thermoelectric Modules (TEMs) is considered ‘the standard’ in the thermoelectric industry. This broad product line of high-performance and highly reliable TEMs is available in numerous heat pumping capacities, geometric shapes, and input power ranges. Assembled with Bismuth Telluride semiconductor material and thermally conductive Aluminum Oxide ceramics, the CP Series is designed for higher current and large heat-pumping applications. For all CP Series modules, wire is stranded, 114 mm (4.5 in.) long and PVC insulated. PC Series - Thermal CyclingThe PowerCycling Series is a thermoelectric module (TEM) designed for thermal cycling between multiple temperature set points and is ideal for applications in healthcare [and others] where fast temperature changes are required. The module is specially constructed to reduce the amount of stress induced on the TE elements during operation. This product line has been tested to withstand more than 500K cycles without degradation in performance. The TEMs are assembled using Bismuth Telluride semiconductor material and thermally conductive Aluminum Oxide ceramics. PolarTEC™ Series - High VolumeThe PolarTEC™ Series is a porch-style thermoelectric module (TEM). The hot side ceramic has an extended edge, which allows for a strong lead attachment to accommodate the wiring of multiple TEMs into an array. This product line is available in 4, 6 and 8 Amp configurations and is ideal for high volume production. Assembled with Bismuth Telluride semiconductor material and thermally conductive Aluminum Oxide ceramics, the PolarTEC™ Series is designed for higher current and larger heat-pumping applications. UltraTEC™ (UT) Series - High Power Thermoelectric ModulesThe UltraTECTM Series is a high heat pumping density thermoelectric module (TEM). The module is assembled with a large number of semiconductor couples to achieve a higher heat pumping capacity than standard single stage TEMs. This product line is available in multiple configurations and is ideal for applications that require higher cooling capacities with limited surface area. Assembled with Bismuth Telluride semiconductor material and thermally conductive Aluminum Oxide ceramics, the UltraTECTM Series is designed for higher current and larger heat-pumping applications. ZT Series - High Performance Thermoelectric ModulesThe ZT Series is a high performance thermoelectric module (TEM). 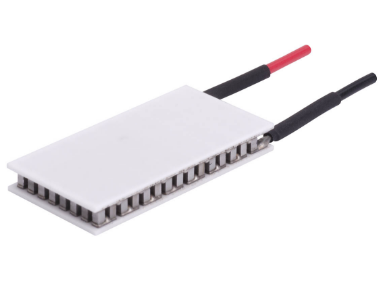 The module is assembled with premium Bismuth Telluride semiconductor material that achieves a higher temperature differential than standard single stage TEMs. This product line is available in multiple configurations and is ideal for applications that require to reach cold temperatures. Assembled with top grade Bismuth Telluride semiconductor material and thermally conductive Aluminum Oxide ceramics, the ZT Series is designed for higher current and larger heat-pumping applications. For all ZT Series modules, wire is stranded, 200 mm (8.0 in.) and PVC insulated. SH, RH Series - Center Hole (Annular) Thermoelectric ModulesThe SH Series is an annular-style thermoelectric module (TEM). The hot and cold side ceramics have a circular hole in the center to accommodate light protrusion for optics, mechanical fastening or temperature probe The RH Series is an annular thermoelectric module (TEM) that is round in shape. The hot and cold side ceramics have a circular hole in the center to accommodate light protrusion for optics, mechanical fastening or temperature probe. Supercool & Melcor TEC'sWe can supply TEC’s from the old Supercool & Melcor ranges. Temperature ControllersWe provide a range of OEM, cased and benchtop temperature controllers. All our controllers offer PID temperature control to make full use of the ability to accurately control TEC’s. Heatsinks, Fans & MetalworkThe range of heatsinks we supply includes bonded fin, high performance extrusions, liquid and liquid to air. Our heatsinks can be supplied as standard sizes with or without fans or customised to any configuration. Liquid Cooling & ChillersWe supply a range of active thermoelectric & compressor based cooling systems. In addition to this we supply standard passive air to air and air to liquid cooling solutions. The Ceramic Plate (CP) Series of Thermoelectric Modules (TEMs) is considered the standard in the thermoelectric industry. This broad product line of high-performance and highly reliable TEMs is available in numerous heat pumping capacities, geometric shapes, and input power ranges. Assembled with Bismuth Telluride semiconductor material and thermally conductive Aluminum Oxide ceramics, the CP Series is designed for higher current and large heat-pumping applications. For all CP Series modules, wire is stranded, 114 mm (4.5 in.) long and PVC insulated.